Park Sydney’s inner Sydney apartments are nestled just 4km from the CBD and only two train stops from Central Station. 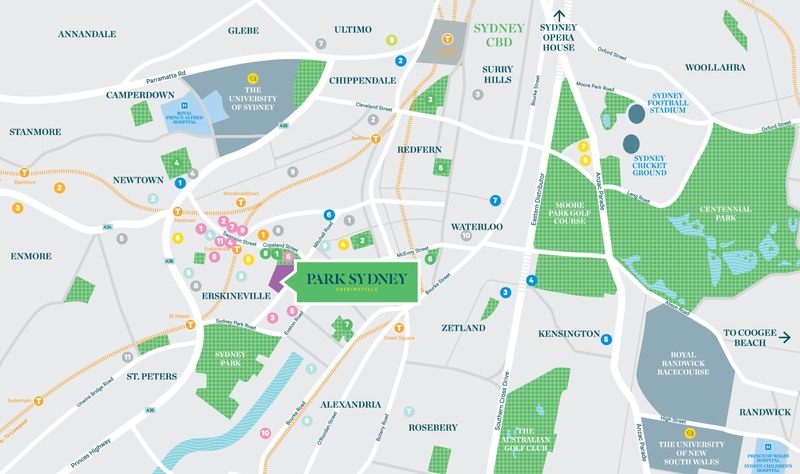 Conveniently close to a range of major universities, Park Sydney is easily accessible by public transport from the University of Sydney, University of NSW, and University of Technology. Far enough to escape. Close enough to never miss out. Erskineville is a vibrant and artistic cultural hub in one of the most connected locations in Sydney, with a thriving, close-knit local community that is absolutely bursting with character. As one of the most sought-after suburbs in the heart of inner Sydney, you’ll find your own slice of serenity amongst green parks, historic terraces, and leafy tree-lined streets. Don’t miss your last chance to own an apartment at one of the most significant new developments in Sydney. A melting pot of food, arts and entertainment, Erskineville has retained its relaxed, easy-going village atmosphere even after decades of change. A family friendly hub with parks, playgrounds, and a new childcare centre. Home to fresh produce, specialty provedores, a gourmet café and restaurant strip. Calm, safe cycleways and ample bike parking. Integrated retail convenience to suit the hours of your lifestyle.